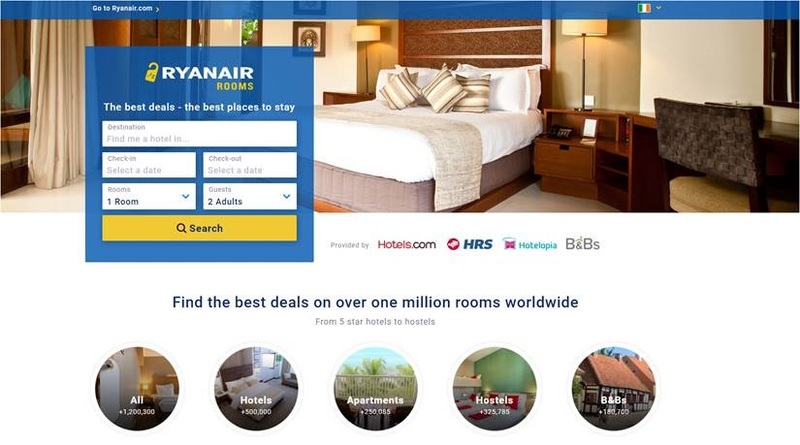 DUBLIN, Ireland, 2017-May-22 — /Travel PR News/ — Ryanair, Europe’s No.1 airline, today (17 May) launched a major upgrade to its “Ryanair Rooms” website, offering its 130m customers an even wider choice of hotel, hostel, B&B, holiday villa and homestay options, and all at the lowest prices. This improved “Ryanair Rooms” website is the latest digital initiative delivered under Year 4 of Ryanair’s “Always Getting Better” programme, as Ryanair strives to become the “Amazon of travel”, with Ryanair.com now the world’s largest airline website, its best-in-class app having over 19m active users and more than 20m customers signed up for the “My Ryanair” customer registration programme. “We’re pleased to launch a major upgrade to our “Ryanair Rooms” website, our latest “Always Getting Better” improvement. This industry leading website now offers customers even more choice, enhanced search options and a simplified booking process, ensuring they can choose their ideal accommodation – but always at the lowest prices. This entry was posted in Airlines, Business, Travel, Travel Apps, Travel Marketing, Travel Tech, Travelers and tagged Kenny Jacobs, Ryanair, “Ryanair Rooms” website. Bookmark the permalink.